Singapore has recently submitted its intended emissions reductions plans to the UNFCCC. What does Singapore’s commitment mean? Is it good or bad? Green Future Solutions director Eugene Tay offers an analysis. 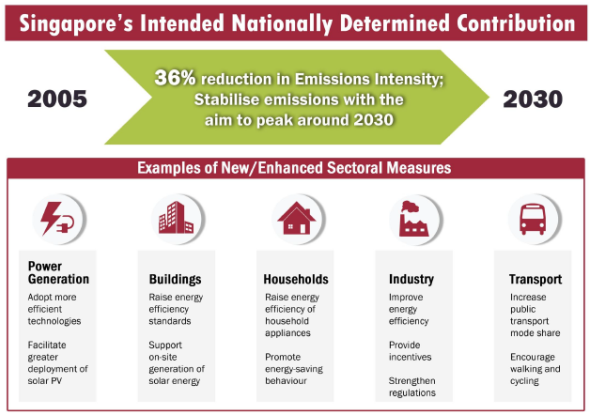 Singapore’s INDC states that it intends to reduce its Emissions Intensity (EI) by 36 per cent from 2005 levels by 2030, and stabilise its emissions with the aim of peaking around 2030. Singapore’s Emissions Intensity or greenhouse gas (GHG) emissions per S$GDP (at 2010 prices) in 2005 is 0.176 kgCO2e/S$. A reduction of 36 per cent would mean that Singapore’s EI in 2030 is projected to be 0.113 kgCO2e/S$. Although Singapore currently accounts for around 0.11 per cent of global emissions, we are still committed to be a responsible country and reduce our emissions. Singapore had previously pledged in 2009 to reduce its emissions by 7 per cent to 11 per cent below its business-as-usual (BAU) level by 2020, and if there is a legally binding global agreement, to reduce its emissions by 16 per cent below BAU level by 2020. For example, the graph below shows that Singapore’s EI is ranked 113th out of 140 countries globally (or among the best 20 per cent of countries). Despite that, Singapore is committed to reduce its EI further. From 2005 to 2020, the planned reduction of Singapore’s EI is around 1.5 per cent annually. For the new INDC target, Singapore’s EI would have to decline further by around 2.5 per cent annually from 2021-2030. It is time for companies to consider climate change efforts more seriously and lower their carbon footprint and be more energy efficient. Besides companies, individuals also have to reconsider our consumption behaviour and reduce our carbon footprint in our daily lives. Other critics dismiss our efforts in saying that China’s INDC has also set peaking emissions around 2030 (and making best efforts to peak early) and has a higher EI reduction of 60 per cent to 65 per cent from 2005 level by 2030. 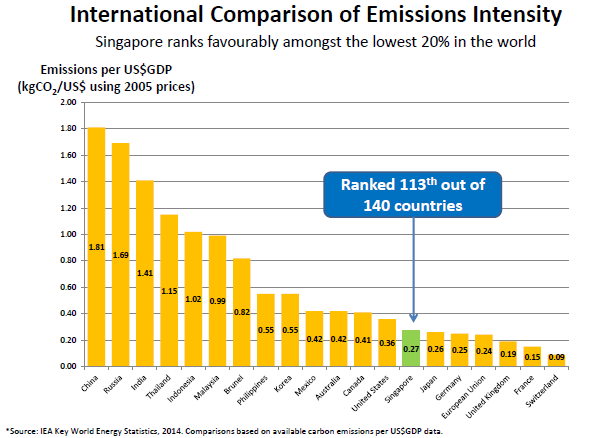 We think that it is not fair to compare Singapore with China as China has greater scope in reducing emissions through lowering coal consumption and having more hydro, nuclear, wind and solar power. Over 90 per cent of Singapore’s electricity is currently generated from natural gas, the cleanest form of fossil fuel. Therefore, further mitigation efforts will focus on greater energy efficiency and clean energy adoption. The government will adopt a multi-pronged approach to reduce Singapore’s greenhouse gas emissions across all sectors (see measures below). The government will continue to push for solar energy in the public and private sectors. By 2030, it is estimated that renewable energy could potentially contribute up to 8 per cent of Singapore’s peak electricity demand. We think that it is possible to have solar energy contribute more than 8 per cent of energy demand by 2030. For example, the Solar Technology Roadmap developed by the National Climate Change Secretariat (NCCS) and the National Research Foundation (NRF) suggests that it is possible to have solar electricity contribute 19-30 per cent of electricity demand in 2050, under additional to strong energy efficiency efforts and for an accelerated scenario of full utilisation of effective area and accelerated growth in photovoltaic efficiency, yield, and cost reduction. Eugene Tay is director of sustainability consultancy Green Future Solutions. This post is republished from the Green Future Solutions blog with permission.